Posture. Seen at the excellent Space Shifters exhibition in the Hayward Gallery at London's Southbank Centre, in 2018. 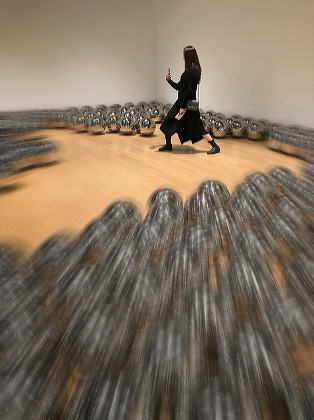 The stainless steel orbs are part of an installation by the Japanese artist Yayoi Kusama, originally staged back in 1966 but recreated several times since then in a variety of settings. I loved the pose of the Japanese lady photographing her friend in the middle of the installation and grabbed a couple of shots on my own iPhone. I'm impressed by the technical quality of the original image from a slowish exposure on such a small sensor, which needed very little adjustment in post-processing, but I decided – rightly or wrongly – to create a 'rushing' effect to add a little drama.